Mt. Laurel resident Mathew Gunkel was recently recognized as the national Registered Nurse Hero of the Year by BAYADA Home Health Care. Pictured, from left: BAYADA CEO David Baiada, David Stratton, Joanne Stratton, RN Hero of the Year Mathew Gunkle, Dominic Stratton, former BAYADA Director Ann Baiada, and BAYADA Chairman Mark Baiada. Mt. Laurel resident Mathew Gunkel was recognized as the national Registered Nurse Hero of the Year by BAYADA Home Health Care. 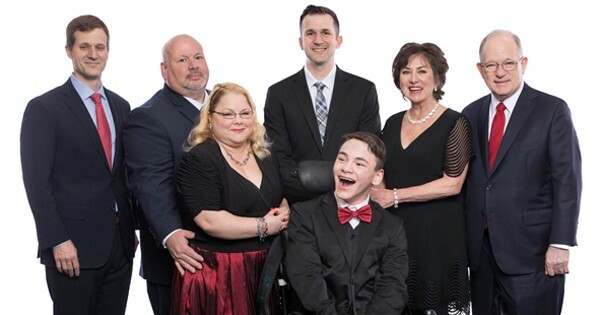 Chosen from among thousands of nominees, Gunkel accepted the award before nearly 3,000 employees at the company’s annual awards meeting held on May 19 in Charlotte, N.C. BAYADA CEO David Baiada presented the award. Joanne and David Stratton of Mt. Laurel couldn’t agree more. Gunkel cares for their son Dominic, an enthusiastic 16-year-old boy with cerebral palsy and Type 1 diabetes. “Mat gives Dominic the attention that a boy his age deserves and wants,” said David Stratton, who said he grateful for the nurse who took it upon himself to attend seminars and research everything he could about his son’s complex medical needs. For Gunkel, who said he is humbled by the recognition, caring for Dominic is more than simply a job – it is a calling. Some some might argue that it’s Gunkel who is changing lives, especially Dominic, the recipient of a new adaptive bike, thanks to the nurse who has become his best friend. Insurance covered the cost to replace the stander and gait trainer but denied the request for a new adaptive bike. With a price tag of $5,000, the bike seemed hopelessly out of reach. That’s when Gunkel stepped in. Gunkel made it his personal mission to raise $5,000 so Dominic could start riding again. He contacted everyone he knew, as well as local businesses and TV news stations. BAYADA’s Hero Committee took notice of Joanne’s nomination. First, Gunkel was celebrated as a local Hero, then he learned he had won the divisional Hero honor. Several months later, he stood on the stage in front of the packed ballroom, his National Hero Award in his arms, expressing heartfelt appreciation for the recognition.